EFG1914 is a digitisation project focusing on films and non-film material from and related to World War I. It started on 15 February 2012 and runs for two years. 26 partners, among them 21 European film archives, are working towards the following main goals: 1) To digitise 661 hours of film and ca. 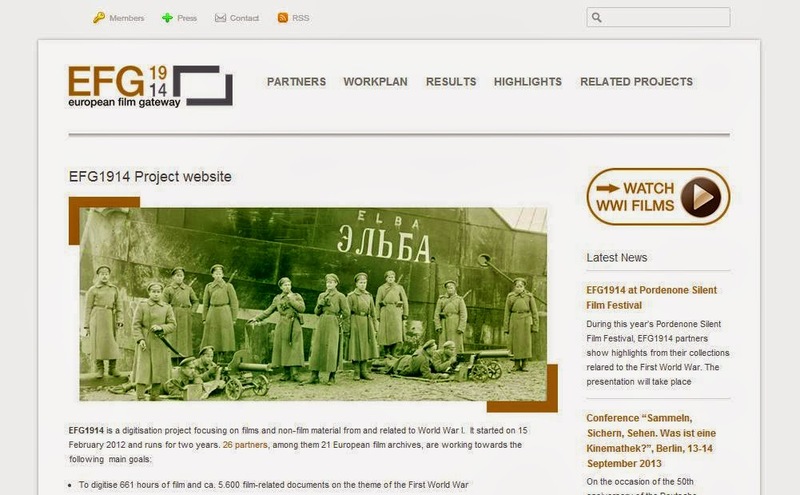 5.600 film-related documents on the theme of the First World War 2) To give access to the material through the European Film Gateway and Europeana 3) To build a virtual exhibition using selected objects digitised in EFG1914. EFG1914 covers all the different genres and sub-genres relevant in that time: newsreels, documentaries, fiction films, propaganda films. Moreover, EFG1914 will also give access to anti-war films that were mainly produced after 1918 and which reflect the tragedies of the 1910s. This material is of special importance since only around 20% of the complete silent film production survived in the film heritage institutions. Therefore, EFG1914 set out to digitize a crucial part and a critical mass of these remaining moving image records, mostly undiscovered by the public. EFG1914 is the follow-up project of EFG – The European Film Gateway (2008-2011). The main outcome of the EFG project is the online portal The European Film Gateway, which gives access to several hundreds of thousands photos, films, texts and other material preserved in European film archives. More information on the initial EFG project can be found here. EFG1914 represents a considerable share of what has been preserved from the time. Digitising and giving online access to the WWI-related films and documents held by the archives will make it easier for a wider audience to use them. The archives contributing to EFG1914 are located in 15 different European countries, many of which were the main powers during the First World War (eg, Austria, Belgium, France, Germany, Great Britain, Italy, Romania, Serbia etc.) or remained neutral like Denmark, Spain and the Netherlands. Thus, the films offered on the European Film Gateway show the Great War from different perspectives and different countries. Österreichisches Filmmmuseum will talk about their collections and highlight selected films. The EFG1914 project continues the work carried out by the EFG project in 2008-2011, which developed the European Film Gateway. At present over 600,000 items from 24 film archives are available online at europeanfilmgateway.eu and europeana.eu. EFG1914 was commissioned by the Association des Cinémathèques Européennes (ACE) and is co-funded by the Community Programme ICT PSP. The project started in February 2012 and will last for two years. It is coordinated by the Deutsches Filminstitut in Frankfurt.